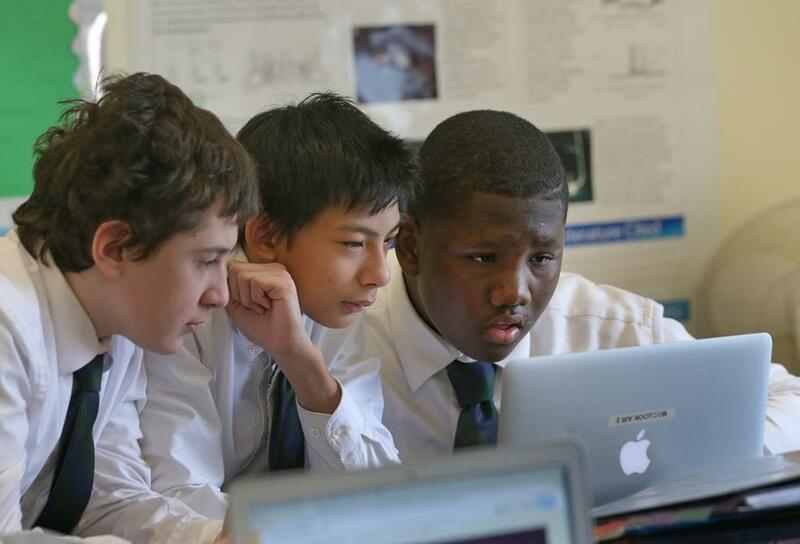 Michael SaPonte, Francis Puente, and Jahsiah Montissol worked in a middle school science class at Loyola Academy at St. Columbkille. In spring 2006, the St. Columbkille School in Brighton seemed to be on the brink of closure. Enrollment had dwindled to 274, from about 1,800 in the early 1960s. Now, nine years later, signs of a turnaround are evident. Enrollment has grown to 380 students — a population that is racially and economically diverse — and is anticipated to increase to 420 for the next school year. Standardized test scores have risen dramatically. The school is undergoing substantial renovations, including a new gymnasium and outdoor recreation area, in an effort to attract more middle school students.Outside donors recently pledged more than $2 million. School leaders attribute the uptick to the unique partnerships it forged with Boston College, which in 2006 began running St. Columbkille along with the Archdiocese of Boston, and to private donors. They hope the school, renamed the St. Columbkille Partnership School, can serve as a model for Catholic schools not just in Boston but across the country. Head of School William Gartside has started to speak with school administrators in Dayton, Ohio, Philadelphia, and New York City about implementing this model. 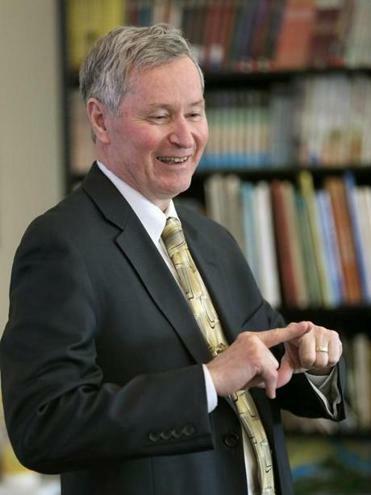 “It’s at a pivotal time that if we don’t do something about Catholic education, it will really disappear,’’ Gartside said. The past several years have seen many Catholic schools close around the country amid lingering effects of the recession, a drop-off in the number of nuns as teachers, and the fallout from the clergy sexual abuse crisis. After years of sharp decline, however, enrollment in Boston-area Catholic schools is leveling off. Gartside said that enrollment surged in the 1960s as Catholic schools became more prestigious and the general student population increased. Then in the 1970s, enrollment began gradually decreasing, and it crashed in the early 1990s to around 2005. This resulted in a number of school closings, including the high school at St. Columbkille in 1993. The turnaround, he said, is largely thanks to Boston College. The university has provided financial aid, funds for renovations, and educational support by overhauling the curriculum and paying for all teachers to study for master’s degrees. Kathy P. Mears, the superintendent for the Archdiocese of Boston, said the intent is to expand upon St. Columbkille’s model. The archdiocese has a small network of partners that it is working to develop, both in the higher education and business communities. “St. Columbkille’s is a wonderful example of the great strides that can be made in Catholic education when we collaborate,” she said. Other such partnerships have formed in the area, including: Endicott College is in its third year of a partnership with Immaculate Conception School in Newburyport; and Regis College has teamed up with several schools including Trinity Catholic Academy in Brockton and Lawrence Catholic Academy. St. Columbkille is now focused on its middle school grades and has renamed the sixth through eighth grades as Loyola Academy. Peter McLaughlin, chairman of the school’s board of trustees, said he wants to transform Loyola into a “destination middle school” by offering strong academics, high-quality facilities, and a wide range of after-school programs. After Grade 6, school officials said, enrollment starts to drop as students leave for Boston’s exam schools. But by adding programs and renovating the school, officials think they will be able to recruit and retain students. St. Columbkille recently added seven classrooms, two science centers, an art room, and a music room, and it renovated its administrative offices and cafeteria this past summer. The school is also transforming its parking lot into an outdoor recreation area and redoing its more than 110-year-old gymnasium. John Eriksen, cofounder of the Drexel Fund, a not-for-profit organization based in Illinois that is dedicated to giving more students access to faith-based and private schools, said he is unsure whether this model is a widespread solution to challenges facing Catholic schools. Unlike BC, few Catholic colleges will have the financial resources to help run schools, he said, and Catholic middle schools will have difficulty competing with free charter schools, exam schools, or Catholic high schools that are extending into these grades. “I’m not sure that in and of itself it’s going to stem the tide of school closures,” Eriksen said. 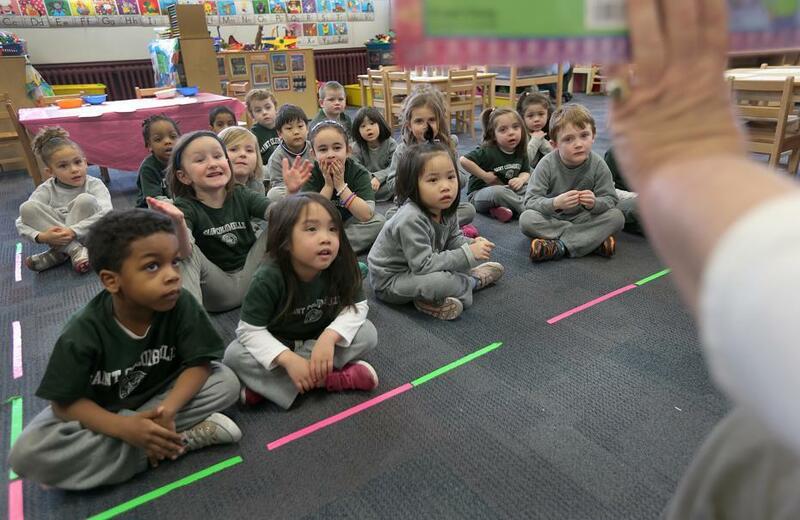 Children pay rapt attention to a story in a K1 class at St. Columbkille Partnership School. But Gartside and others at St. Columbkille are undeterred. Gartside said colleges benefit from having a laboratory to develop the best teaching practices. The school, which was founded in 1901 to serve the Irish and Italian immigrant populations, continues to build upon its mission. At St. Columbkille, 56 percent of students are white; 17 percent Hispanic or Latino; 11 percent black; and 9 percent Asian. Tuition is $5,400 for kindergarten through eighth grade, and school officials say it costs about $2,500 more to educate each child. Forty percent of students receive financial aid. Gartside said his goal is for urban students to have the same high level of education and care as those in the suburbs. Katherine Landergan can be reached at katherine.landergan@globe.com. Follow her on Twitter @klandergan. An earlier version of this story incorrectly identified a partnership between Regis College and a school.